Of the over 550 ornaments Starbucks released since 1995, only 25 have been from Europe. And even then, none until 2014. Asia has released 126 and North America 400, mostly being from the United States. So with 16 of those 25 being from 2018 alone, a bit of love for Europe has been shown. Two ornaments this year are from the new Milan Roastery, a metal roastery facade and a metal siren; and a general set of holiday releases including a red cup, a french press, white cup with gold trees, and a snowman plastic cold cup. But the very special release this year is a set of 10 You Are Here (YAH) Gold featuring the countries of Austria, Belgium, Czech Republic, England, France, Germany, Netherlands, Portugal, Spain, and Switzerland. 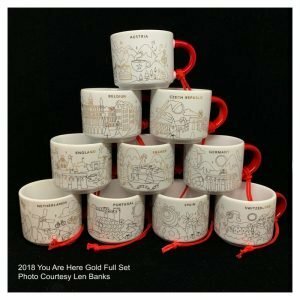 The Gold YAH are a white mug with red handle and red cord adorned with gold metallic city scenes dressed with Christmas lights and wreathes. They are a similar design to the set of 10 featuring USA cities in 2014. The difference being the US mugs had a red interior with white handles and the 2018 Europe have red handle, as already described, and a white interior. Previous European releases included one each in 2014, 2015, and 2017 and six in 2016.